Want to see a car that stands out and gets a lot of attention? Check out this 1966 Chevrolet Impala wagon. Chances are pretty good you’ve never seen another ’66 Impala station wagon that’s exactly like this because it was built with an incredibly rare custom configuration. 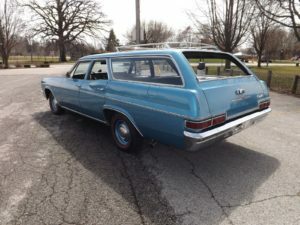 This classic Impala wagon was listed for sale on eBay as of the posting of this article. This one-owner Impala wagon has only 34,000 original miles on it. Since we’re speaking of original… this car has the original motor (more on that in a minute), original paint, original chrome, the factory tach, the original dash clock, and the original brake shoes. While the original brake shoes are intact, the braking system has been updated with new brake lines and wheel cylinders. 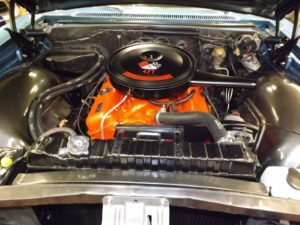 All the aftermarket additions added by the owner were removed and put back to the original factory specs. When ordering this car, the owner wanted a car with the power to pull his race car, a 1957 Chevy. With a ’57 Chevy weighing in around 3,300 pounds, that meant he needed a wagon with some hefty power. So, he ordered this 1966 Chevy Impala wagon with the factory Corvette driveline. This six passenger car has a 427 cid, 390 horsepower engine, a 4-speed transmission, and a factory 12-bolt rear end. This Impala station wagon was parked in a building in Cleveland in 1980, where it sat all these years until discovered by Jim of Jim’s Rare Barn Finds. This car is solid inside and out, plus according to the listing it sounds, runs, and shifts great. There are a few rust spots on the original Marina Blue paint from a leak in the building where the car was stored. 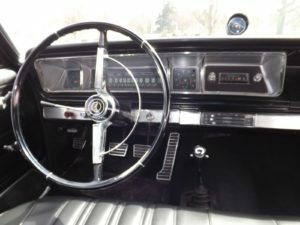 If you’re ready to see yourself sliding behind the wheel of this classic Impala wagon, you may want to know about the rest of the things that were done to put it back to original specs. I won’t detail all of them because you can always visit the eBay listing, but the aftermarket buckets were removed, the factory bench seat was replaced and the towing hitch was removed. The original paperwork comes came with the car as proof that it’s a real COPO (Central Office Production Order) ’66 Impala wagon with the specifications detailed in the listing and video. Part of the magic of this car is knowing the story of the car’s history and how it ended up being a barn find. There are a couple of sweet stories about the car that were shared by the previous owner’s daughter in the video above. One was a story about the only time the car was ever driven in the rain, and another one was about the family sleeping in the car at the races. I won’t give all the details away since it’s someone else’s story, so if you have time, I highly recommend watching it. A comment on the YouTube page that houses the video details what to do if you have an old car that’s just sitting around and you would like to have it considered for an episode of Jim’s Rare Barn Finds.